Many things have been said and written about the giant cliff that forms an uncompromising division between the continent and the open sea. 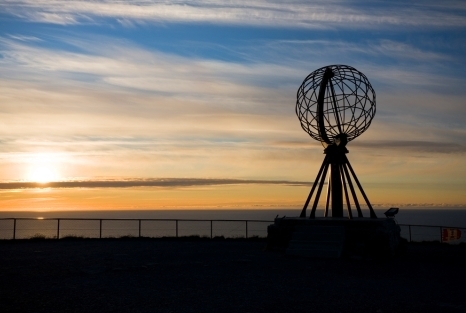 For several centuries the North Cape was reserved for those on adventures and expeditions. Nowadays, more than 240,000 people visit the North Cape each year, many of whom arrive by cruise ship. At 71°10’21", the North Cape Hall lies on the outermost point of the plateau. In good weather, you may be able to enjoy panoramic views of the entire plateau and the open sea. Alternatively, if the visibility is poor, you will be able to experience the supervideograph North Cape panorama, which takes you on a journey through the four seasons in the landscape that is filled with contrasts. If you head further out towards the open sea, you may be able to discover one of the largest Atlantic seabird colonies in the world at the Gjesvaerstappan Nature Reserve. This is where you will be able to enjoy a close-up encounter of some of the most beautiful birds in the world. If you would like to find a luxury cruise that visits The North Cape, please use our contact form to get in touch with one of our luxury cruise specialists.